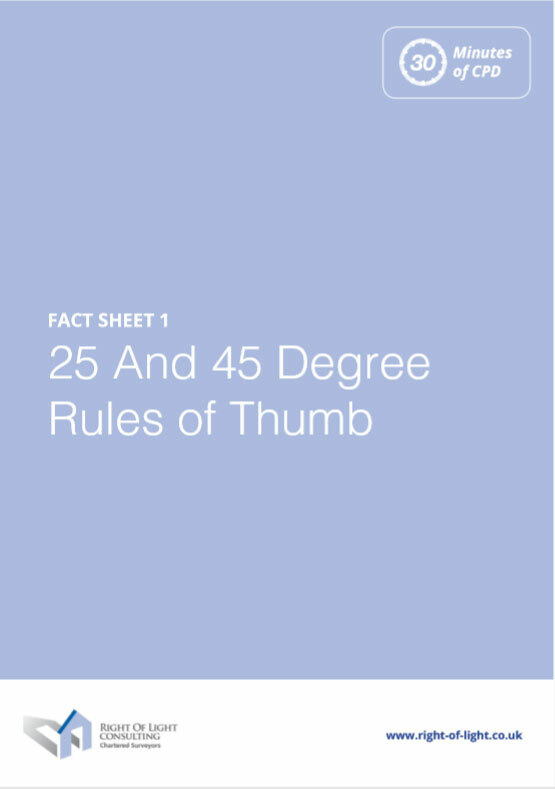 This fact sheet uses simple diagrams to help explain the correct application of the 25 degree and 45 degree rule of thumb planning tests. 25 degree test – applied where the window is opposite the development or extension. 45 degree test – applied where the development or extension is perpendicular to the window. The tests described in this fact sheet originate from the Building Research Establishment (BRE) document ‘Site Layout Planning for Daylight and Sunlight: A guide to good practice’. The rule of thumb tests are used to determine whether or not more detailed daylight and sunlight calculations are required. This fact sheets discusses the impact on neighbouring properties; as well as light levels within proposed new developments themselves.